Badaling Great Wall is situated in Yanqing County, over 70 kilometers north of Beijing. 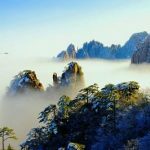 Badaling means “giving access to every direction”. The name itself reminds us of its historical and strategic importance. The Badaling section was constructed in 1502 (during the Ming Dynasty), once served as a crucial military fortification, and is now the most impressive and representative section of the Great Wall. 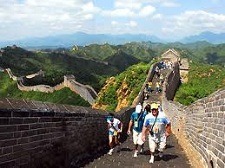 Badaling Great Wall is situated about 10km further north of Juyongguan Great Wall. They are both sited on the same natural pass through the mountains to the north of Beijing and hence a critical point of defense. 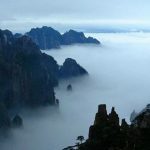 Badaling has a total length of 3, 741 meters with an average height of 8 meters. The highest part is 15 meters. It is 6.5m wide at the base and 5.8m wide at the top – wide enough for five horses or ten soldiers side by side. The wall’s exterior is composed of large granite slabs that surround layers of loess and gravel. Its coping is made of large bricks that provide a smooth walkway, wide enough for ten people to easily walk side by side. A parapet on the coping once provided a defense barrier against assailants. Crenellated battlements decorate the parapet’s exterior. In the battlement, there are square holes, from which soldiers had an outlook and shot at the enemy. Two-story castles lie approximately every 400 meters on the wall. The castle’s second floor gave soldiers an additional advantage over attackers; the arched cavity below was used to store artillery and also doubled as a simple dormitory for the watchmen. A number of high beacon towers were built so that when the enemies invaded, signals could be sent out to call for reinforcement. 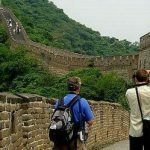 It now hosts a number of modern attractions, including a Great Wall Museum and a Great Wall Cinema. The museum and cinema both provide information about the history and culture of the Great Wall.